Today is my first official long post on my new blog. Hmm, what does one blog about? How about I share something personal? I mean what else is a blog for if not to share your innermost thoughts with complete strangers. It’s basically an amped-up version of the anachronistic “diary” from my girlhood. Only this time, instead of keeping my thoughts under lock and key, I am choosing to divulge my musings. Perhaps my courage to share will inspire you, kind readers, to share your feelings as well. We all have our own story and each of us is the author, editor and reader, simultaneously. Let’s embark on telling our story with gentle honesty. In other words, lets be self-compassionate and extend kindness to however our story unfolds. This is the only way we can extend compassion and empathy to others and their own stories. We might not understand our stories, but we can choose to make space for them to be as they are without judgment. Getting back to the story I teased about sharing with all of you, today I awoke with a feeling. It was not entirely unfamiliar of a feeling but it was something that had not made its presence known emotionally to me in some time. What was the feeling you might wonder? Well, it was grace, at least I believe that is the best descriptor for the inner experience. I am sure a ton of you are about ready to click away to the far more enticing “Cat video fails” that is beckoning your attention in your newsfeed, but bear with me. “Grace” is not normally ascribed to as an emotion. It is more often accompanied by “state of,” but isn’t that how we commonly define feelings and emotions? Are they not a state of being? Are they not normally qualified as being temporary? But, what if it could be a consistent state of being, even if just for a day? Let’s agree to disagree and for any of you “grace skeptics” out there, let’s explore this concept further. When I mentioned waking up filled with a feeling of grace, what struck me was that it did not seem temporary or transient. It seemed consistently present within me. It was as if an anchor of calm weighed steadily on my state of mind. You might even say it could be defined as inner peace. I choose the word “inner” to modify the word “peace” because from an outside perspective, my world was anything but peaceful. The air hung with heavy stifle in the bedroom saturated with staleness and inertia. Sweat accumulated in a neat pool at the peak of my brow. The upstairs neighbor made his presence known with his usual “gymnastics” routine. Or, at least that is what I imagine he is doing since the whole building reverberates with each movement his 400 Lb frame undertakes. I doubt he knows the magnitude of the disruptive effect his single step has upon the slumbering building on early weekend mornings. I send him lovingkindness in my mind each night, but must concede to being perturbed when shaken abruptly awake from the blissful confines of happy dreams. But, today was different. Today, I did not register annoyance, I simply acknowledged the noise but it granted it no power. The same can be said for how I greeted the suffocating air. I felt its presence but did not take it as an affront upon the budding day. Instead, I rose quickly and scanned my phone: my typical detached morning ritual. However, I could not deny something was different within me. Everything looked the same as it had before my head hit the pillow the night before, and yet nothing was as it had been in any way. It was an odd conundrum to ponder and at the same time it seemed perfectly normal. I went about my morning with this “observer” point of view and yet somehow was also an active participant. The biggest shift I registered was that along with this “grace” came a sense of ease and almost play. 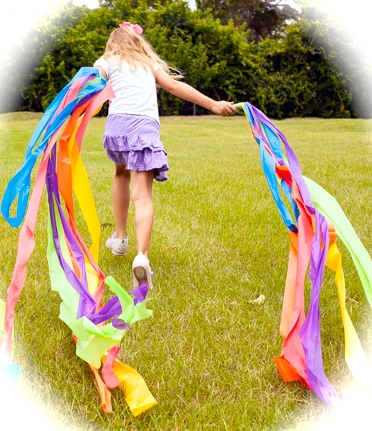 It reminded me of twirling as a young girl with rainbow pallet of crepe paper rolls. I twirled without concern or worry. All my focus was directed at creating a beautiful swirl of colors and of littering the lawn with red, orange, yellow, green, blue and purple waves of delightful mischief. No matter what anyone said or did to me the whole morning, somehow I felt wrapped in the safety of the vision of my rainbow cocoon. From within my cocoon I could hear the pain underneath the snarky comment of the barista or the dismissive remark of the waiter and in both instances, I simply smiled and gently laughed. I did not take offense to what he or she said or did and therefore felt no need to defend myself or my actions. From within my cocoon, I could send the “offenders” grace since I was experiencing it. We can only extend what we have previously or currently felt and known in our own mind. The more I extended grace, the more inner grace and peace I experienced. Even the one time, I stopped someone from exhibiting a behavior I did not feel was kind towards me, I did not limit the act from a place of anger or offense. Ceasing the behavior was my way of showing the “offender” I did not want my story to include an episode of me being a victim today, nor he being my victimizer. It did not matter how he responded to my intervention, it only matter that I chose to make space before responding to his behavior and that I chose to not give away my power to choose how I saw myself in that moment. I cannot help but believe the catalyst to this lasting grace was my decision to embrace my “inner woo” the day prior. What on Earth do I mean you might wonder? Well, to be blunt, I chose to share my authentic and highest self. No longer would I need to mask my intuitions as “lucky guesses” or my insight as “learned during my scholastic pursuits.” Nope. Yesterday, I chose to reflect the source of who and what I am: Light. It all started with me casting aside a long-held judgment about Yoga. For some reason, I associated the practice of Yoga with the “woo-woo” crowd that I secretly feared were “my people.” You would think I would be elated to find my “tribe” and yet, I was miserable at the prospect of a lifetime of being an “other” and not like everyone else. As a young girl random strangers, who usually happened to be self-described Hippies, Yogis or psychics, approached me with tales of my “beautiful aura” or “inner light” and terrified me. What if someone heard these comments? How would I ever fit-in as “normal?” My belief was that if hearing these comments scared me, then surely it would terrify others. I would be the cause and object of their fear. In hindsight, the assumptions seem silly, but at the time and even until fairly recent, it was my truth. Oops, there goes the “lemur” in me again….back to the story at hand. Last week I went to a new acupuncturist referred to me by my physician. My doctor believed my curious bodily symptoms were strongly related to an imbalance and suggested acupuncture as a form of therapy. When I arrived at the acupuncture office, I could not believe my eyes. Standing in front of me was the tiniest, most diminutive woman I’d ever seen. This was the “powerful” healer my doctor had described? Was she even tall enough to reach the treatment table I wondered? After receiving a detailed personal medical history from me, the woman asked me to lie down and began assessing me energetically. She concluded I had a very strong spirit or light on one level but was very weak and depleted on the level of my body. Placing needles in the junction of my inner thigh and knee as well as upon my shins and ankles and elbows, amazement overtook me. Similar to the sensation of rubbing your hands quickly across carpet several times, a tingling sensation or current flowed throw my body. In undulations it traveled with powerful waves of kinetic force, encircling all of me, from head to toe. The acupuncturist came back to check on me and concurred that my body was healing rapidly and that I appeared to have very little resistance to this sort of treatment. With the same grace and ease she originally placed the needles, she removed them. What happened next is a bit of a blur, but I will do my best to recall it. Standing over my body, her stature appeared to grow with each word formed by her lips, harkening memories of Alice ingesting the mushroom to grow taller or smaller. Holding my hand by the wrist with gentle determination, she told me I was at a crossroads in my life. Nodding my head in tacit agreement, she continued. “Your most important lesson is to learn how to shield yourself from other’s negativity. Your great sense of empathy is a blessing in many ways, but you must develop skills to understand other’s discomfort and yet not take on their pain as your own. By either conscious or unconscious intention, other people have attached their negative energy to you, almost as if by suction through hollow tubes or cords. I can see these attachments and they are the source of you feeling drained. You must “cut” them off you each night before sleeping,” she professed. Miming a pair of scissors snipping away the harmful “cords” she encircled my body and “cut” away the heavy feeling that had plagued me for so long. It was incredible. My body seemed to float upwards just a smidge. I felt lighter in all ways. Still stunned and having difficulty finding my voice, I nodded again and agreed to explore the area for classes. Blown away by the improvement I felt after a single appointment, I scheduled a return visit before turning the knob to exit the office. Remembering my promise, I researched and booked a Kundalini Yoga class at a nearby studio the following day. Little did I know that choosing this type of Yoga was no accident. It was exactly what my body needed in all ways. Carrying a rolled Yoga mat on one shoulder and fingers grasping the neck of a bottle of water in my other hand, I turned the knob of the studio’s door and entered. Beams of sunlight streamed into the room. One beam caught the top of the instructor’s head and literally made her glow. She caught my stare and met it with the warmest smile I’d seen. Upon my first step into the class, I felt a strange sense of familiarity and home. One by one the students arrived in their “woo-woo” attire, complete with crystals, beads, and feathers. Taking a huge inhale of faith, I exhaled all my past judgment and fear and took my place at the front of the class, ready to listen and learn. Never had I felt so connected to movement. Not even with Pilates. This was different. It was simple, but deep. Sensations stirred within me that mimicked the energy I felt at the acupuncture visit. Following the gentle instructions of the teacher and blocking out the rest of the students from my awareness, I lost myself in the breath and the movements. At the conclusion of the class, one student approached me and asked me if I believed in this “woo-woo” stuff. By no means, do I mean to single myself out as unique or special with this “reveal,” in fact, just the opposite. All of us have a source within us that shines brightly on the darkest of days and acts as a beacon for those feeling lost and adrift. The form our light manifests may look very different and unique, but the source and the light itself is one and the same: The opposite of fear. By me acknowledging my inner light, such do I accept and recognize the light reflected in everyone and in everything in the universe. For years, I thought sharing my awarenesses would make me different and a pariah of sorts, but with my growing wisdom I have come to know that keeping my awarenesses separate kept me separate. Openly sharing them with the intention of demonstrating there is no separation among any of us on the level of the inner light we contain, unifies our collective consciousness for choosing peace and kindness. The awarenesses I choose to access are just one of many paths to understand our universal connectivity. For me, the best demonstration of the light I perceive is being kind and making space for others to be as they are without judgment. The biggest “a-ha” was that I could not practice being authentically kind to others until I learned to be kind to me. In order to accomplish full integration and application of self-compassion and kindness I had to embrace all of me…And yes, that included the inner “woo” and all. 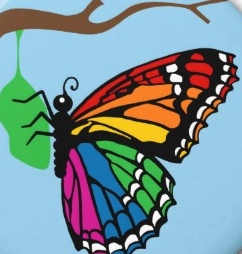 At last, it was safe to emerge from my rainbow cocoon and greet the butterfly within me with open arms and consistent grace. Is there a part of you that you are hesitating to embrace? What are some ways you might begin to explore looking at all of you without judgment? How can you extend kindness to yourself? Next ArticleHow would you respond to this question? Reblogged this on jen's yoga gate.